The Delta fall protection harness is part of Capital Safety's premium range of harnesses and is considered the best selling harness in the world, being convenient, comfortable and highly durable. Based around the Revolver torso adjuster, this has become the workhorse of the industry, representing the culmination of over 20 years of research, design and manufacturing know-how as well as extensive field-testing. The Delta Harness features coated, corrosion-resistant hardware, water-repellent and abrasion-resistant webbing and protected labels with secure Velcro covers. This system features a patented triangular design allowing them to be done quickly and easily and the torso adjuster means fast and secure adjustments can be made safely. 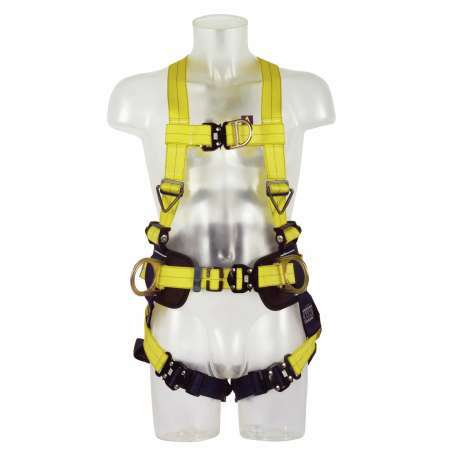 The Delta harness also features stand up dorsal D rings, (spring-loaded) which makes connections safe easy and fast. The tech lite aluminium alloy quick connect Buckles permit a reduction of weight and add to the overall safety for the user. Efficiently record and store information on inspections using our exclusive I-Safe system and due to the soft breathable materials used in the construction of the harness the shoulder straps will not rub your neck and the harness will hold its basic shape, allowing you to use it safely and comfortably with the minimum of chafing. The webbing is made with our Repel material make it highly water repellent and reduces the attraction of mould and dirt, it also has up to 5 times the resistance to abrasion of normal webbing materials. This harness is in full compliance with CE EN361, CE EN358 and CE EN1497 (on applicable models). The maximum arresting force is 6kN MAF and it is rated at a capacity of 140kg.